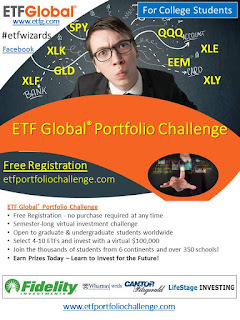 Fall 2017 ETF Global Portfolio Challenge - Registration Now Open! 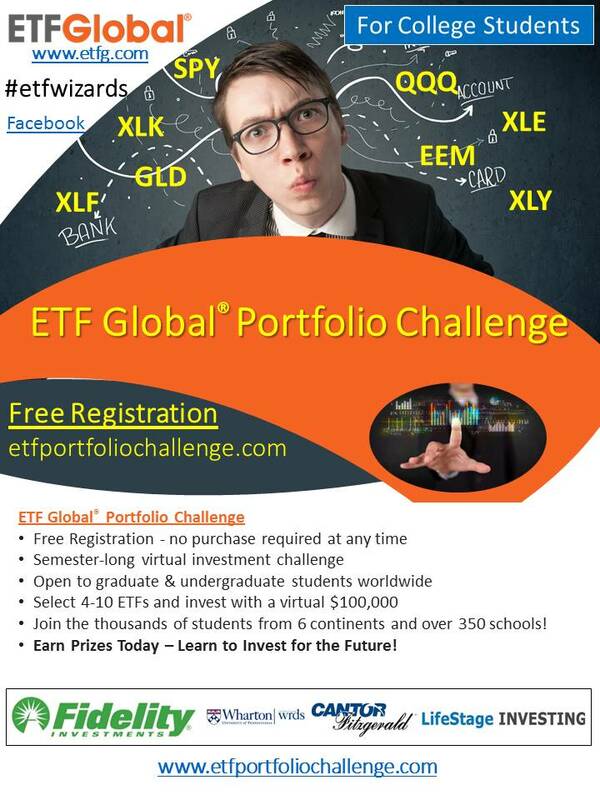 Thursday, June 29, 2017 - Registration for the Fall 2017 ETF Global® Portfolio Challenge is now open! Enrollment will remain open until Friday, September 22nd and the performance period will officially begin on Monday, September 25th. Why: ETFs are taking on an increasingly prominent role in the securities markets and it is now more important than ever for students to have an understanding of these investment vehicles before making their transition from the classroom to the professional workplace. Our contest offers students a unique, immersive opportunity to learn about investing in ETFs and complements their academic studies by offering a window into simulated real-life trading and investing. Tuesday, June 27, 2017 - Stock indexes were anemic last week despite strong showings by Technology, Healthcare and Biotech Stocks. Headlines included MSCI’s decision to add China A Shares to their Emerging Markets Benchmarks – a real win for China which lobbied hard for its inclusion and the Italian Government’s taxpayer funded bailout of 2 regional banks which give reason for European investors to breathe a sigh of relief and should allow European shares, particularly Financials, to resume their upward march. US Investors journeying overseas to Europe could find the wind to their backs from both increasing stock prices and a weakening dollar should interest rates continue to stagnate or decline. Of course the big news in the US was the revelation of the long awaited Republican Senate’s Health Bill. While addressing some of the more controversial particulars of the Affordable Care Act, it also included a hefty dose of Supply Side Tax Cuts to certain high income earners as well as select industries. No doubt this plays into the first act of any significant fiscal stimulus effort i.e., reflationary effort. Investors should carefully watch for indications of passage of this bill as lack of passage would indicate a stalling of the Trump pro-growth agenda due to political deadlock. This would be a disappointment for investors. US Benchmarks were mixed with the S&P 500 closing up .21% for the week to 2,438.3 and the Russell 2000 rising .57% to 1,414.78. The tech heavy Nasdaq Composite rose a hefty 1.84% to 6,265.25 while the S&P Technology Index rose 2.3% and the Healthcare Index rose 3.7%. Biotech Stocks continued their move up as well - the latter two benefiting from the Senate’s Health Care Proposal. Internet stocks continued to roll along with the DJ Internet Composite closing up 2.95% as investors reflect on the consequences of FANG and companies expanding their footprint into traditional businesses. Indeed with just 5 days to end the first half of the year, US investors have cause to celebrate with the S&P 500 likely to close near +9% for the period all the while enjoying unusually low volatility and a noticeable lack of any minor retracements. JP Morgan’s Marko Kolanovic noted on June 13th that in the past 20 years, the VIX index has closed lower than 10 on a total of 11 days; seven of those days were in the past month. Given leveraged asset prices and a less accommodating global monetary environment, volatility is sure to return. Hence, caution is the call. The yellow flags we see on the second half horizon are a flattening yield curve – a harbinger of low growth or worse and declining commodity prices led by oil and other mining commodities. While declining oil prices (US Crude down -2.68% to $43.13 per barrel) dragged down Energy Stocks by -2.9% for the week, more troubling is the continued yield decline of the 10 Year Treasury by -.11% to 2.155% decreasing the slope of the yield curve even more. Continued interest rate declines indicate that bond investors see slow growth and possibly more disinflation due to disruptive technologies and low aggregate demand due to low wage growth on the employment side. This had the effect of dragging down Financials by -1.7% whose fortunes are tied to higher interest rates. While we are told that oil is suffering a temporary oversupply rather than decline in demand, we cannot help but wonder if the increased use of natural gas, wind and solar power are chipping away at demand not unlike Coal, despite the White House attempts to talk up the black rock. Could the long observed correlation that strong oil prices indicate strong economic activity be weakening? One bright note is that household formation demographics are fueling a recovery in housing prices which will have the affect of offsetting any pinch from potential stock market declines. Investors wanting to bet on the passage of the Senate’s Health proposal should consider loading up on Health Care and Biotechs – astute traders can use the double or triple levered versions. Technology continues to be a good bet as well. Nevertheless, we continue to believe that the animal spirits unleashed by the excitement of the Trump Presidency are alive and we would not leave the party yet. The underlying expectations for earnings increases to drive stock prices are being fuelled by demographics in the housing sector and the obvious need to boost infrastructure spending. We continue to favor the Reflation trade and the proposed tax reform and relaxed financial regulations could benefit sectors like select Financials, Utilities, Technology, Healthcare Insurers, Hospitals and Pharma companies – although significant risks abound in the healthcare sector. Indeed our ETFG Quant Score list shows 7 of the top scoring funds in our Top 25 Quant Rankings fall into our above narrative with a score of 71 or better. They include QQQE and BBH for US BioTech and Tech plays, PGI, FXI, FNI, AADR and EWY for China and Asian exposure. Given the value play in Energy Sector, we would look at the Select List to find some good ranking there. See last week’s Perspective. Looking at our Quant Movers Weekly Top % Gainers, we find 5 of the top movers are Infrastructure themes: AMZA, MLPX, YMLI, NFRA and TPYP - VEU, TUR, VWO, and ECH come up for International Exposure. We suggest looking over the Quant Movers Daily % Movers to zero in on attractive plays and sudden changes in our ratings outlook. Tuesday, June 20, 2017 - Stocks were mixed last week driven by various news headlines including a terrorist attack on GOP Congressional Members while practicing for a baseball game, an expected Fed Funds Rate increase of 25 bps, the retirement of Jeff Immelt from GE and the Friday surprise announcement by Amazon of its acquisition of the Whole Foods supermarket chain. US Equities continued their record climb with the Dow Jones Industrial Average hitting a new closing record of 21,384.28. The S&P 500 closed relatively flat at 2,433.15 and the NASDAQ Composite closed at 6,151.76. Crude oil prices eased to $44.74 a barrel - a drop of 2.4% for the week. Treasury prices firmed especially on the long end of the curve. While easy money continues to fuel asset prices, markets shrugged off comments by noted observers that the US political process hit a new low with the early morning attack on GOP members. Friday, investors refocused on the big FANG Stocks after a brief slide and how these technology stocks will expand their footprint into new sectors bringing new efficiencies and compressing margins of existing retailers. Amazon is the lead disruptor in this space. Especially vulnerable are retailers and brand name manufacturers ranging from food condiments like spices, to razor blades and battery manufacturers like Duracell. While Investors continue to hold out for the Trump “Reflation” trade, they now face headwinds from the usual Washington political stalemate as well as recession “yellow flags” like weak oil prices and a continued T-Bond price rally (where yields fell) indicating the Bond Vigilantes continue to see weak economic expansion. Indeed airline delays and woes on the Amtrak Northeast corridor (its most popular line) signal the need for a big infrastructure spend. This week overseas investors will be focused on MSCI’s decision due this Tuesday on whether to include China A Shares into one of its flagship Emerging Markets Indexes. Expect continued saber rattling on the Korean peninsula and more clashes in the Middle East. Market Rally skeptics continue to dwell on concerns that the popular indexes are being driven by a small number of tech stocks which carry a heavy weight in market cap weighted indexes such as the S&P 500, thus setting the scenario that they gain from momentum trades of active managers buying them while trying to keep up with the index returns. While this is true, investors will be reassessing how strong the “Moat” is around these FANG Stocks. We suspect the Moat’s sustainability factors are very strong and that, combined with cash on hand and high stock prices, will enable Tech firms to become more active in making acquisitions in non-technology areas as a means for earnings growth. These acquisitions will have long-term structural changes in certain sectors of the economy. We continue to believe that the animal spirits unleashed by the excitement of the Trump Presidency are alive and well. We continue to favor the Reflation trade and the proposed tax reform and relaxed financial regulations that could benefit sectors like select Financials, Restaurants, Utilities, Technology, and Healthcare Insurers – although significant risks abound in the healthcare sector with proposed reforms. Like healthcare, tax reform will not be easily resolved. Value Investors should include Energy stocks in their portfolio. Indeed our Quant Score list shows 10 of the top scoring funds as Energy funds and 4 of the top 10 Quant Movers for the past week were in Energy. The list includes IEO, RYE, XLE, IXC IYE, JHME, FILL, FXN, FENY, VDE, ERGF and FRAK. Interesting Theme ETFs that look attractive from our models include OLD, FITS, SMH and XSD. We suggest looking over the ETFG Select List to zero in on attractive plays and sudden changes in our ratings outlook. We may be entering a period of market leadership changes within some sectors, so be sure to check the Quant Movers Daily. Monday, June 12, 2017 - Another week packed with political uncertainty throughout the world. Former FBI Director James Comey testified in front of congress after his dismissal from the position by President Donald Trump. Attorney General Jeff Sessions came under increasing fire for the Russian meddling claims and in the UK, Theresa May did not get the majority vote to keep the conservative party in control. All of this news somehow overshadowed the start of a program that will create a paradigm shift for those who work on Wall Street. Last Friday, the first phase of the DOL rule went into effect which will now require brokers to create investment portfolios in the best interest of their clients. Though still under review and not going into full effect until January 1st of 2018, this rule is intended to define how brokers interact with their clients. The markets mostly shoved off the political uncertainties with the S&P 500 finishing down only 4 points for the week and the Dow Jones finishing up about 90 points settling at 21,271. That was not the case however for Nasdaq and the overall tech sector in general. Late Friday afternoon the Nasdaq started to fall off, losing about 1.8% or 113.85 with the big names such as Facebook, Apple, Microsoft and Google accounting for most of the loses. This caused the technology sector ETFs to subsequently fall off such as The Technology Select Sector SPDR Fund (XLK) which lost 1.42 points on Friday or 2.47% finishing at $56.02. Same goes for the First Trust NASDAQ-100 Technology Sector Index Fund (QTEC). It lost 2.40 points and subsequently closed at 64.40 or down 3.59%. Our ETFG Quant Model however sees this slip up as a buying opportunity for the Tech Sector Funds. The highest rated fund in our daily updated reward scoring system is the Direxion NASDAQ-100 Equal Weighted Index Shares (QQQE). It comes in with a highly rated fundamental score with its P/E, P/CF and P/B all over 99 points out of 100. In our model that means that compared to the history of the fund, it is looking extremely cheap at the price it is currently trading at right now. Let’s see what next week brings for the market but if the past is any indication of the future, who knows what will happen. A few things that are for sure, the Federal Reserve will come out with their next decision on a rate hike on Wednesday along with the Monthly Producer Price Index data and the Consumer Price Index data coming out on Tuesday and Wednesday. This will surely be watched closely by market participants and can be a true gauge the current health of the overall economy. Thank you for reading the ETF Global Perspectives! ETF Global Model Portfolios now on HedgeCoVest Platform! Wednesday, June 7, 2017 – ETF Global has partnered with HedgeCoVest LLC to add four new institutional-quality strategies to the HedgeCoVest Managed Accounts Platform and the SMArt Xchange (‘SMArtX’), a unified managed accounts platform available exclusively to SS&C Advent clients. The relationship with HedgeCoVest will offer access to the ETF Global® Dynamic Model Portfolios for Wealth Advisors utilizing the HedgeCoVest and SMArtX platforms. “Inclusion on the HedgeCoVest platform continues our path of strategic expansion in the products and services offered while maintaining our unwavering commitment to delivering the best research, data and solutions in Exchange-Traded-Funds. We look forward to working with the entire team to deliver these strategies to leading Financial Advisors” said Chris Romano, Director of Research at ETF Global. Utilizing its proprietary trading technology, HedgeCoVest allows clients to allocate in real-time to ETF Global's four “Base” strategies in a separately managed brokerage account. HedgeCoVest offers Advisors real-time performance reporting and intra-day liquidity for both traditional and alternative strategies, while taking advantage of the security and transparency of a managed account. “We are excited to expand the selection of investment strategies available to Advisors, while remaining consistent with our approach of delivering high levels liquidity, transparency and security in the investment process,” said Evan Rapoport, CEO of HedgeCoVest. “Our vision and commitment to the highest industry standards are shared by ETF Global and we look forward to working with them to provide Advisors with these Model Portfolios of Exchange-Traded-Funds. All four of the ETF Global® Dynamic Model Portfolios are now available through HedgeCoVest and its white-labeled SMArtX platform, including Aggressive Global Growth, Moderate Global Allocation, Balanced Global Growth & Income and Conservative Global Income strategies. ETF Global® (ETFG®) is a leading, independent provider of data, research, investment decision support applications, proprietary risk analytics and educational offerings for Exchange-Traded-Products. The ETFG research platform, which is driven by the ETFG Multi-Factor, Quantitative Model (ETFG Quant), supports the overall investment process with a variety of strategies and applications to pursue return, manage risk, utilize investment analysis and generate investment ideas. Founded in 2011, the firm is headquartered in New York and maintains offices in both New York City and Pittsburgh, PA. More information about ETF Global and our services, applications and products is available throughout our site, here at www.etfg.com. HedgeCoVest is the creator of an award-winning, real-time investment platform that revolutionizes the managed-accounts industry. HedgeCoVest’s proprietary trading technology empowers wealth advisors with traditional and alternative institutional investment management in unified managed accounts, while providing liquidity, transparency, security, and flat fees. The SMArt Xchange (“SMArtX”) is a next generation unified managed accounts platform open exclusively to clients of SS&C Advent. SMArtX combines HedgeCoVest’s proprietary trading and managed accounts technology with SS&C Advent’s powerful suite of tools for wealth advisors. Monday, June 5, 2017 - Several major stock indexes around the world surged to record highs this past week, propelled by investor confidence in global economic growth and corporate earnings. These record gains were registered in the face of an increasingly precarious political backdrop. In addition to the escalating investigation into Trump-Russia collusion and its adverse implications for the passage of pro-growth legislation, political uncertainty was compounded this week by fraying transatlantic ties. After refusing to endorse NATO's collective defense clause, withdrawing from the Paris climate accord, and delivering a sharp rebuke of Germany's trade policies, the US longstanding cohesion and cooperation with EU countries was suddenly cast into doubt. The US increasingly inward looking foreign policy threatens to unsettle the close transatlantic relations that have underpinned the post-WWII international order and has added another layer of uncertainty to our already embattled administration. These developments occurred alongside the continued descent of oil prices, a downgrade in China's credit rating by Moody’s, a drop in US treasury yields to a seven month low. Despite this rising undercurrent of political tumult and waning growth expectations signaled by the bond markets, the DJIA, S&P 500, NASDAQ joined global indexes like South Korea's Kospi and Germany's DAX to close at record highs on Friday. With the results from nearly every S&P 500 company being released, corporate earnings are up 14% from a year ago. Friday's job report, despite coming in slightly lower than expected, was received by investors as solid enough for the Federal Reserve to continue on its path of interest rates increases later this month. Additionally, global inflation, manufacturing, and other economic data releases pointed to continued, albeit slow, economic expansion. This surge in equities helped fuel another solid week of inflows for ETFs. ETFG Fund Flow Summary - According to our fund flow summary, US listed ETFs attracted $13.6 billion is fresh inflows this week, bringing year-to-date inflows to over $200 billion. International equity ETFs continued to be a source of focus for investors, as they amassed $3.5 billion in creations this week. US equity ETFs reversed its trend of four consecutive weeks of outflows, after posting over $7 billion in creations. US fixed income ETFs also had a strong week with over $2 billion in inflows. As domestic equity indexes rose to record highs this past week, it comes as no surprise that several of their index-tracking counterparts populate the top 10 inflows list this week. SPDR S&P 500 ETF Trust (SPY) was the leader in inflows this week, with over $6 billion in creations. PowerShares QQQ Trust (QQQ) finished 4th in inflows, with over $464 million, followed by iShares Core S&P 500 ETF (IVV) and Vanguard S&P 500 ETF (VOO), which finished 7th and 10th respectively with $352 and $294 million. The top 10 list was rounded out with several international ETFs, including iShares MSCI EAFE ETF (EFA) and Vanguard FTSE Europe ETF (VGK), and a couple of fixed income ETFs, like iShares 3-7 Year Treasury Bond ETF (IEI). Continued worries over the enduring oil glut and a flattening yield curve, led several energy and financial based ETFs to register some of the largest redemptions this week. Energy Select Sector SPDR Fund (XLE) and SPDR S&P Oil & Gas Exploration & Production ETF (XOP) posted the 3rd and 8th largest redemptions this week, with outflows totaling $203 and $130 million. SPDR S&P Regional Banking ETF (KRE) was 10th in outflows, as investors withdrew $116 million from the fund. Although equity markets have proven to be incredibly resilient this year, they face a series of potentially destabilizing events this week. With former FBI Director James Comey's testimony, the ECB monetary policy meeting, and the UK's snap election all set to take place on June 8th, significant risks loom for the markets this week.